One more night of adjusting a mic, opening a vein and letting it flow. One more moment for the greatest little big man the game has known to speak his heart and mend his soul. Can a drama junkie ever have a happy ending? And if so, what does that look like for Allen Iverson who, after enrapturing everyone at the Hall of Fame induction ceremonies this weekend, now goes back to the life of a retired 41-year-old with the second half of his life in front of him? He didn’t die on the stage at Symphony Hall in Springfield, Massachusetts, Friday night. If anything, Iverson was reborn. He finally got to pick the way he wanted to be remembered. Amazingly, after 32 conscience-cleansing minutes during his induction speech, the legend of A.I. grew. He’s more of a counterculture god now than he was a week ago. Why do people feel so emotionally connected to this flawed, 6-foot-1, 160-pound blur, who only played basketball for a living? He told us Friday night in his speech. The name “Stanky Wanky” had never previously been uttered at a Naismith Memorial Basketball Hall of Fame enshrinement ceremony. Nor had Biggie Smalls, Tupac Shakur, Rick James and Michael (Jackson, not Jordan) received afterlife shout-outs on the same night as posthumous inductees. The greatest seeker of forgiveness the NBA has ever known, Iverson was publicly absolved of all his sins – those committed against the game and society and those imagined. It was less a speech than a catharsis, a soul-scrubbing confessional that brought deep affection and a throaty roar from a spellbound audience that remained standing, applauding – taking in all that Iverson is and all that he was: the heart-and-soul hellion maneuvering that slight frame through all those mounds of muscle. The most compelling and confounding player of his generation now has a bronze bust, just like O’Neal, Yao Ming, Tom Izzo, Sheryl Swoopes and the rest of the 2016 Hall of Fame class. No matter how many practices he missed, how many times he told coach Larry Brown to step off, how many knucklehead hangers-on from Hampton Roads he kept around – no matter even that he was 90 minutes late for his Hall-of-Fame jacket ceremony on Thursday afternoon – no one can take basketball immortality away from him now. And that’s what’s worrisome, the idea that a goal seemed achieved, a finish line crossed and, really, what’s next? Iverson was always an incentive-based person – as a kid, as a player at Georgetown, in the NBA. Put the right carrot in front of him and he will chase it. His last season in the NBA was in 2009-10. He played briefly in Turkey and formally announced his retirement in 2013. The Hall of Fame ceremony has been his carrot the past three years. 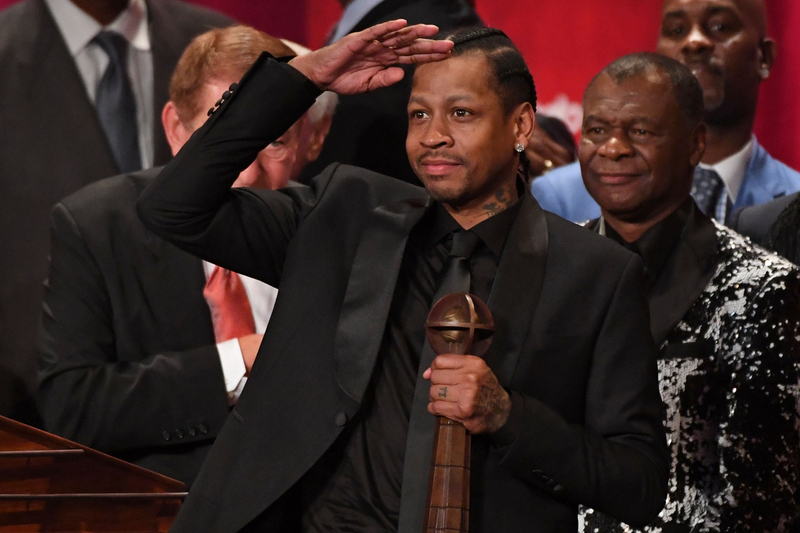 Inductee, Allen Iverson poses for a photo on stage after the 2016 Basketball Hall of Fame Enshrinement Ceremony on September 9, 2016 at Symphony Hall in Springfield, Massachusetts. Other than perhaps boxer Mike Tyson, I’ve never seen such a flawed athlete with such a magnetic pull on people. His vulnerability, his ability to go to deep places inside himself, didn’t just make him beloved in the black community, it made him beloved in the human community. Iverson’s cultural capital has not been this great since he led the underdog Philadelphia 76ers to the 2001 NBA Finals. He’s our troubled brother, the one who keeps making terrible life decisions, yet we can’t kick him out because everybody in the household would be worried sick if he left and something happened. There was a time when he was a polarizing figure, when the NBA was transitioning from Michael Jordan’s retirement and was wetting its pants that it would lose its white market share because of players like Iverson: young, black, all tatted up, all cornrowed – all ‘tude. Hoop Magazine, a league publication, actually airbrushed his tattoos off a cover photo in 2000. But 2016 does not see his persona as a recalcitrant who needs to grow up. Now that part of A.I. is … authentic. Crazy, but true: We now want him as is. We flipped the script. Mainstream white America 20 years ago saw N.W.A.’s music as filth, perpetrated by misguided, angry kids from Compton, California, who really needed to clean up and get a day job. Today, Straight Outta Compton is a critically lauded film and Ice Cube and Dr. Dre are seen as visionaries, prophets who preached the street gospel of America’s urban blight. Once a warning, now Iverson’s realness can matter again. John Thompson III mentioned to me Saturday morning that among his current players at Georgetown, Iverson is far and away their favorite player. Today. It’s doubtful an NBA team would hire him as a scout or executive or a network would hire him as a commentator. They’d be too worried about his litany of no-shows, the drama that comes with the package. But what better, keep-it-real public speaker is out there? To tell not just tell his tale to schools, but to embolden corporate executives – tell them there’s a larger pot of gold somewhere out there, and that if a waif of a player from Hampton Roads, Virginia, has the heart to find it, so can you! If I were his business manager, I’d start selling him on the idea of parlaying this weekend into tomorrow. Because if Iverson needs one thing today, it’s not another ovation telling him how great he was. It’s another finish line, challenging him into what he can still be. Here’s hoping he can find it.